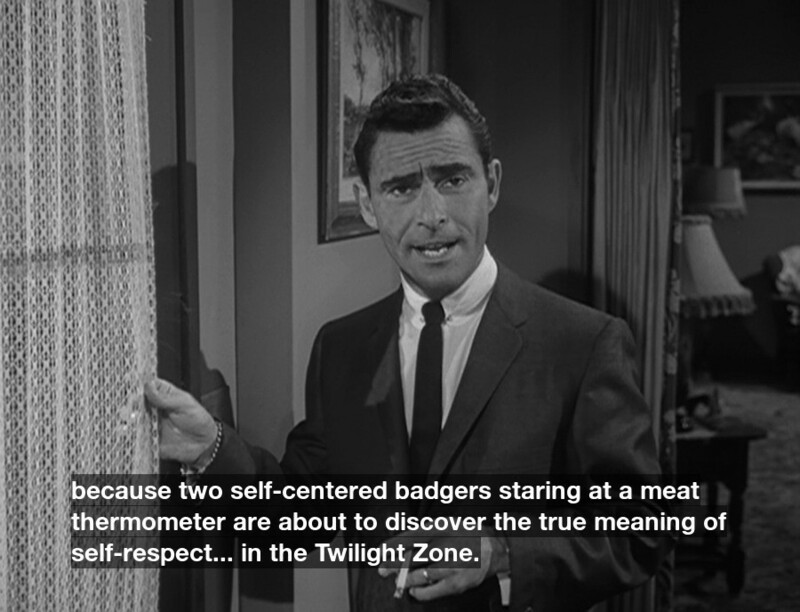 Twilight Zone intros, the early years. If you have ideas for new ones, contribute in the github! 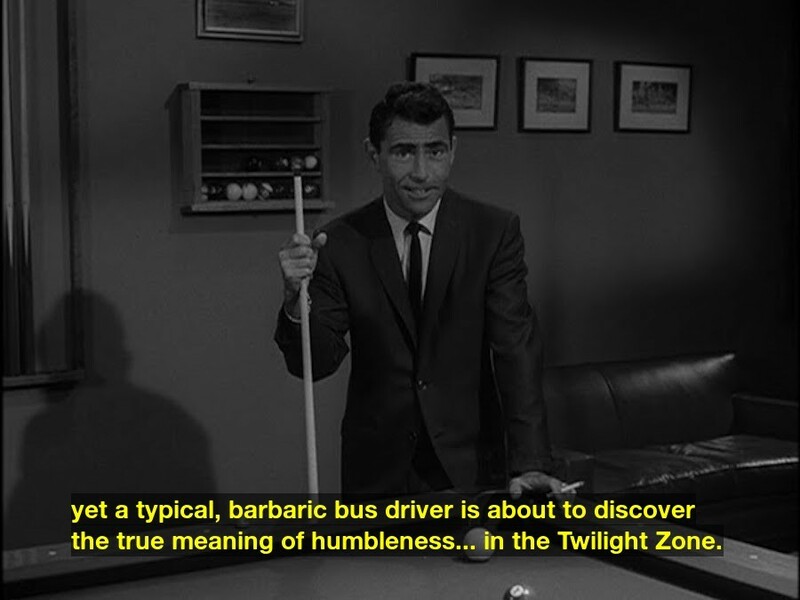 yet a typical, barbaric bus driver is about to discover the true meaning of humbleness... in the Twilight Zone. and an unexceptional, snide scientist is about to join a beef stew worshipping cult... in the Twilight Zone. A flayed seal, an amputated arm, some Windex... and Ms. Rinda Isbell. 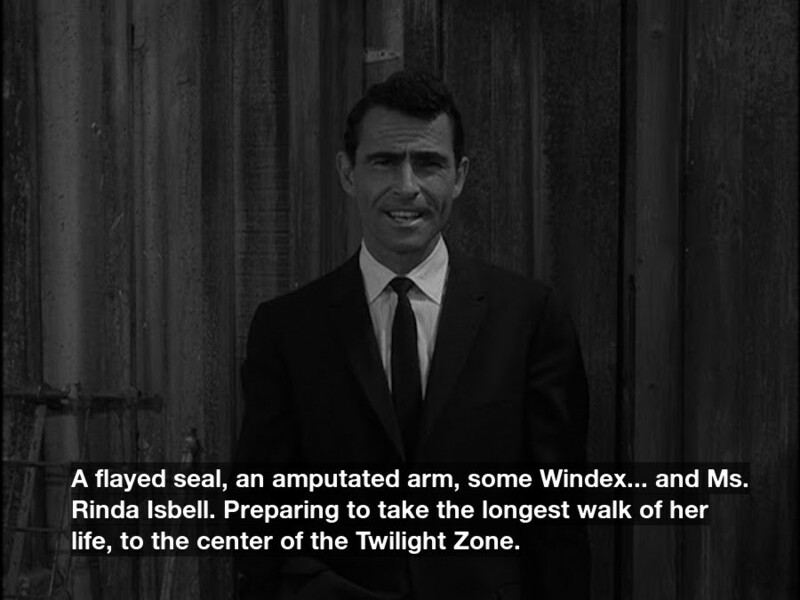 Preparing to take the longest walk of her life, to the center of the Twilight Zone. 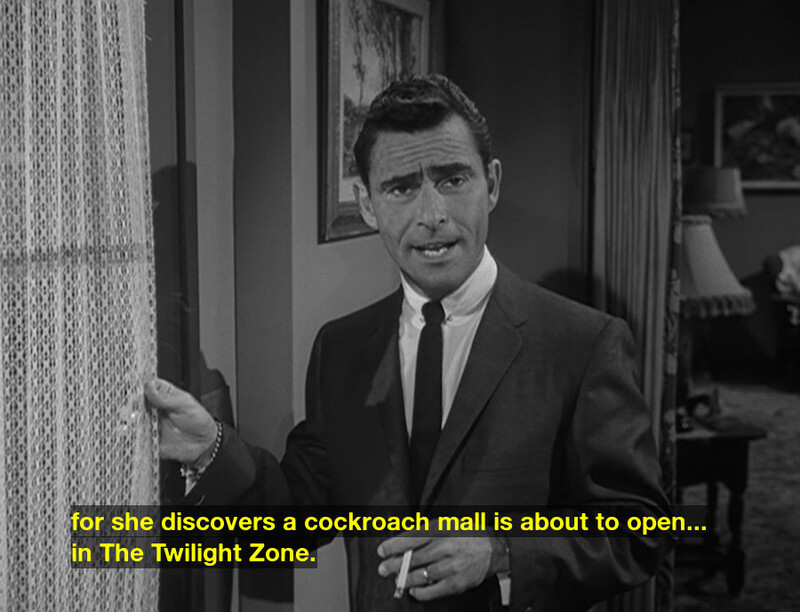 for she discovers a cockroach mall is about to open... in The Twilight Zone. 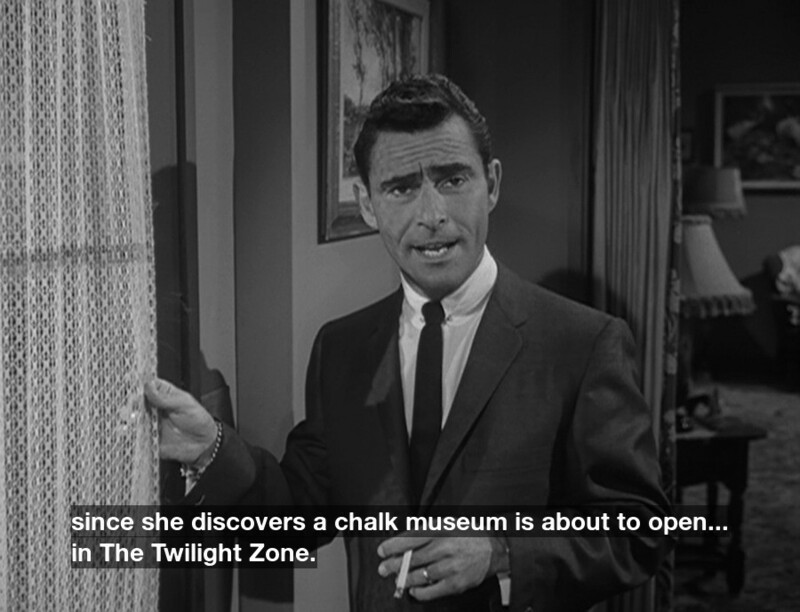 since she discovers a chalk museum is about to open... in The Twilight Zone. 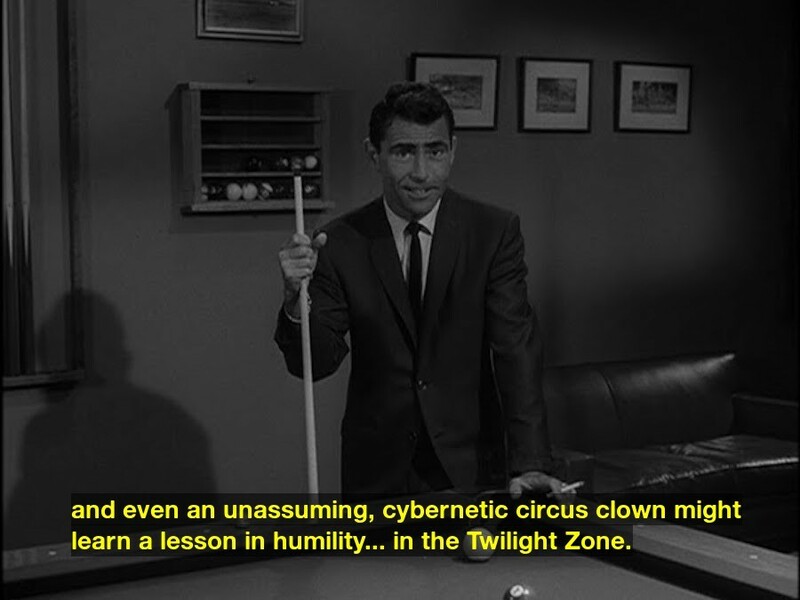 and even an unassuming, cybernetic circus clown might learn a lesson in humility... in the Twilight Zone. Consider Erastus Estes, a barbaric grave digger. 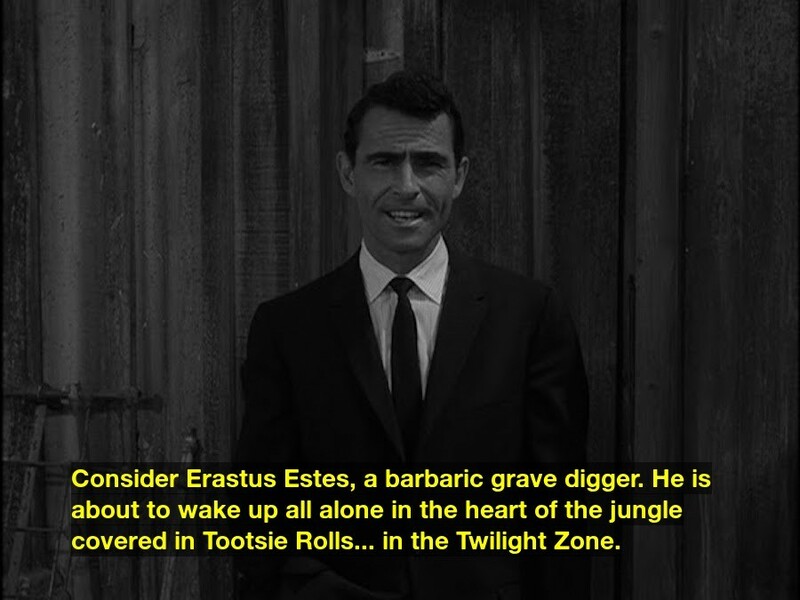 He is about to wake up all alone in the heart of the jungle covered in Tootsie Rolls... in the Twilight Zone. 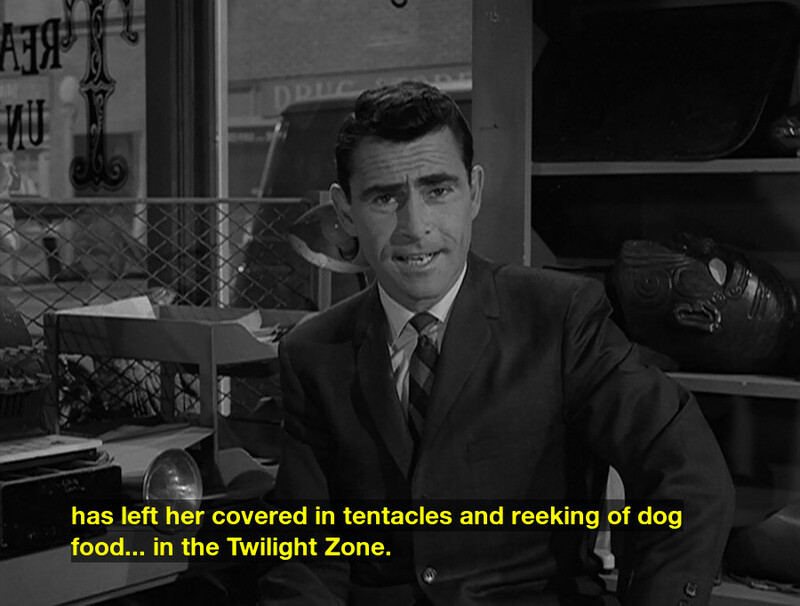 has left her covered in tentacles and reeking of dog food... in the Twilight Zone. 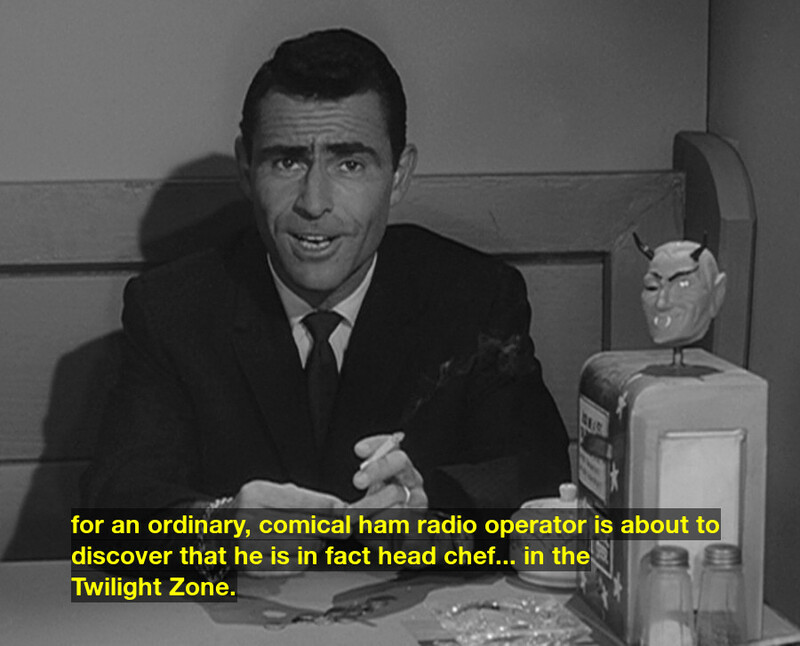 for an ordinary, comical ham radio operator is about to discover that he is in fact head chef... in the Twilight Zone. 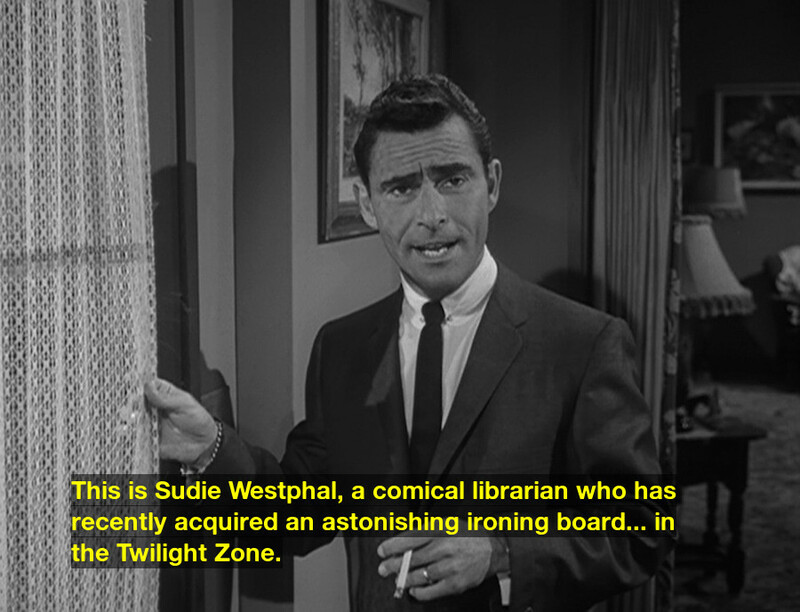 This is Sudie Westphal, a comical librarian who has recently acquired an astonishing ironing board... in the Twilight Zone. 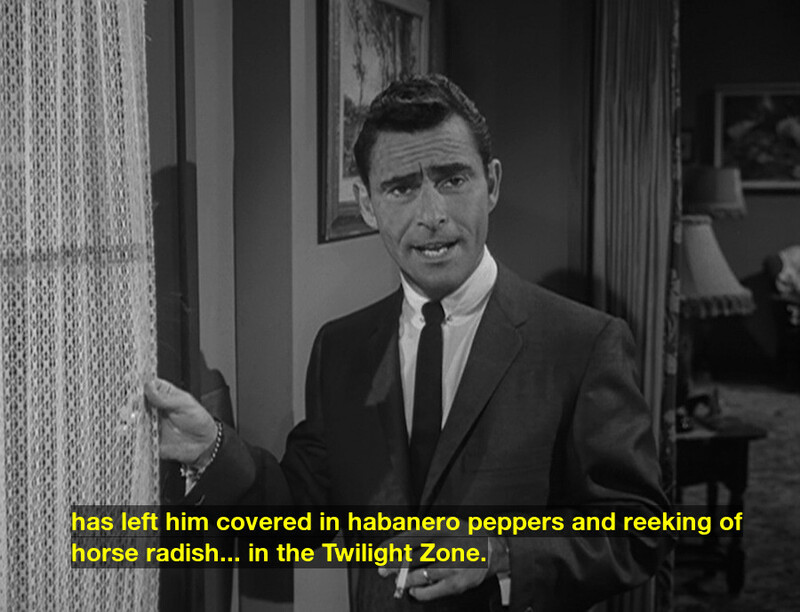 has left him covered in habanero peppers and reeking of horse radish... in the Twilight Zone. because two cybernetic astronauts attempting to eat a slide rule are about to discover the true meaning of love... in the Twilight Zone. This is Neil Grigsby, he is about to understand what is the true potential of human depravity as his neighbor calmly applies maple syrup to his chicken fried steak... in The Twilight Zone. 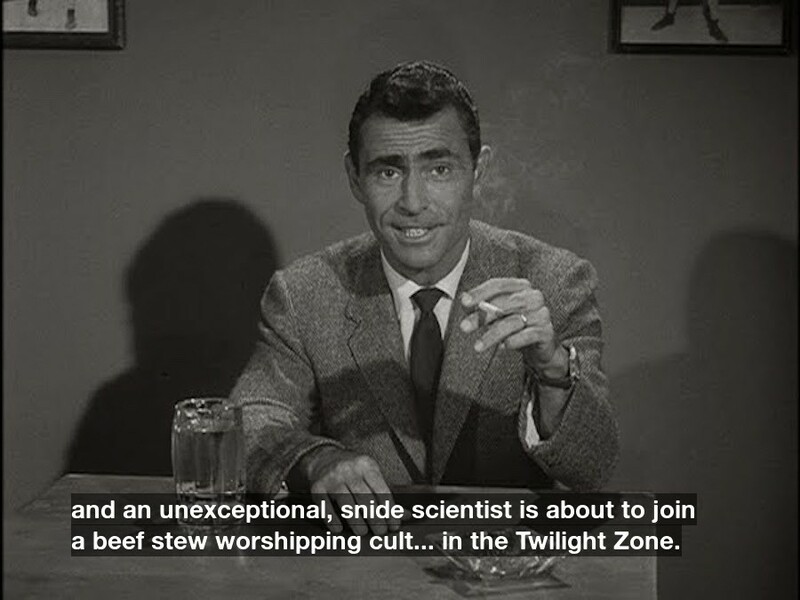 Consider Johnson Glasgow, he is about to understand what is the true potential of human depravity as his neighbor calmly applies crushed oreos to his french fries... in The Twilight Zone. 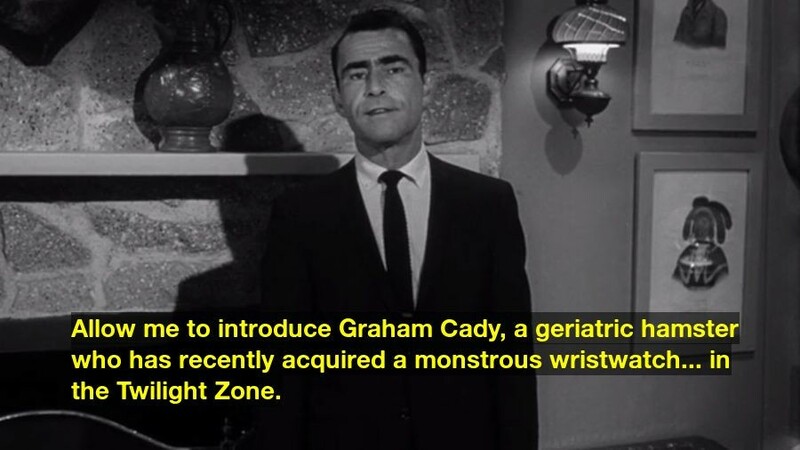 Allow me to introduce Graham Cady, a geriatric hamster who has recently acquired a monstrous wristwatch... in the Twilight Zone. Meet Vernon Yount, a snide monkey. He is about to wake up all alone in the middle of the desert covered in pickle juice... in the Twilight Zone. 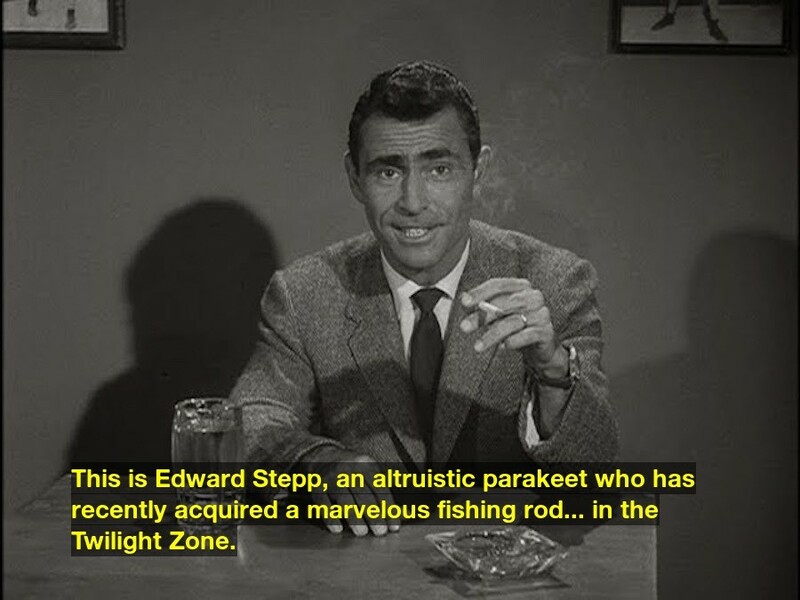 This is Edward Stepp, an altruistic parakeet who has recently acquired a marvelous fishing rod... in the Twilight Zone. A flayed boa constrictor, an amputated ear, some hair dye... and Mr. Dudley Valdez. 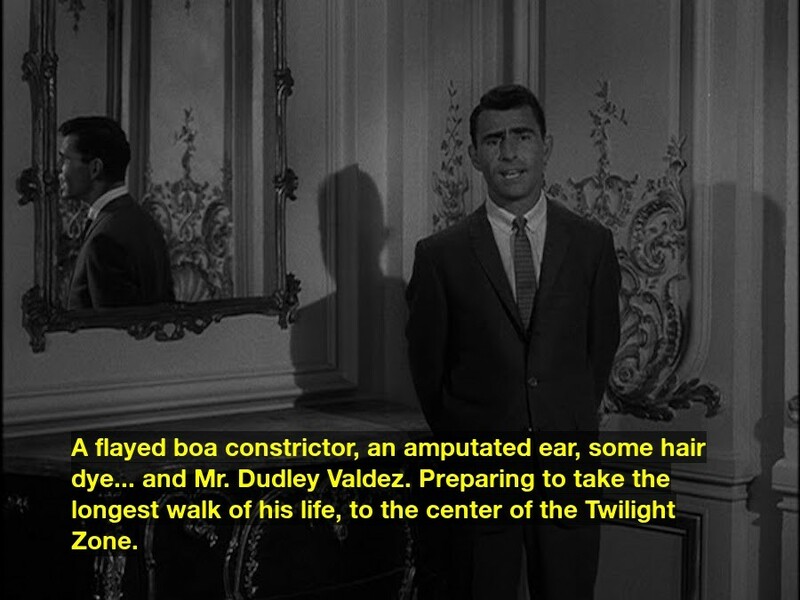 Preparing to take the longest walk of his life, to the center of the Twilight Zone. Meet Charlie Gillette, he is about to learn the true potential of human perversion as his neighbor calmly applies chocolate syrup to his pork chops... in The Twilight Zone.